I received a beard grooming kit from a brand who are based not far from me in Maldon, Essex and I am starting by testing the The Beard and the Wonderful Moustache Wax. As I have said in previous reviews, the products are placed in order as they arrive and so it can take a while to get to an oil or balm, however I don’t receive as many moustache waxes and so I am able to review them almost immediately. This is the first strong hold moustache wax that I have used and so I expected to struggle to scrape it out of the tin and to work it until it was ready to use. However it’s not, it actually quite easy to get some from the tin and it takes only a small amount of work between thumb and forefinger until ready to apply. This is a 15ml tin and its unscented, what makes me recommend this wax is that its only £2.25 and that is an incredible price. The price doesn’t mean that the product is cheap though, this is a good quality wax that will keep your moustache looking good throughout the day, it’s just unscented. I can see the benefits in an unscented wax, I have used an oil or a balm on my beard and then used a scented moustache wax and unless the balm/oil matches the wax, you end up only being able to smell the wax. An unscented wax can be used with any of your oils and balms. The Beard and the Wonderful include a small leaflet (in top photo) on how to use the various products and I see quite often posts from guys unsure on how much to use or why to use a balm instead of an oil. The website also contains a page on ‘How to Maintain Your Beard’ with information on what the products are and how to use them. 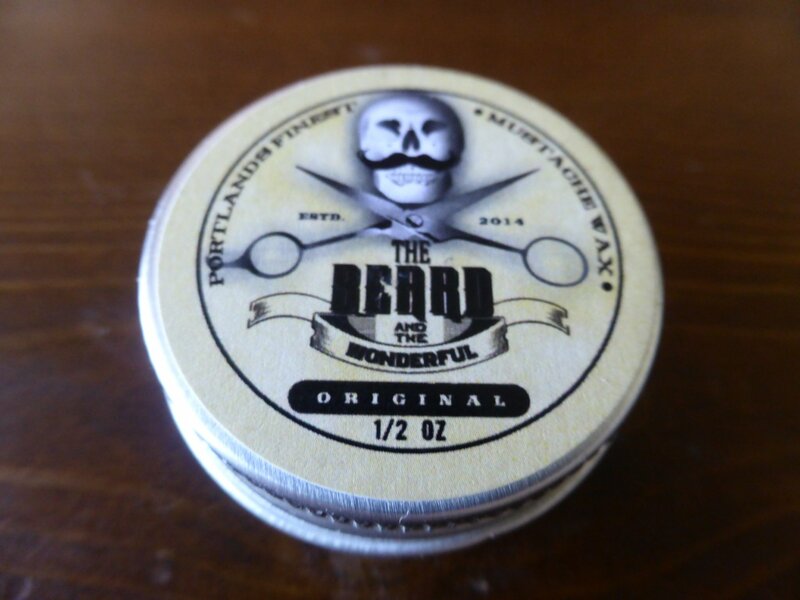 The Beard and The Wonderful are a manufacturer and distributor of men’s cosmetics, based in Maldon, Essex, UK. We produce a number of products that include beard oils, balms and waxes to traditional recipes using premium pharmaceutical grade ingredients that are nut allergy friendly. All of our beard care products are manufactured in a secure, hygienic location, using the best quality, cosmetic grade ingredients and manufactured in small batches and according to EU legislation. Like many great products, our oils, balms, waxes, and pomades were originally created for our own personal use. We were frustrated by the lack of premium quality grooming products available to men and just wanted something that worked! Holding and shaping products made for ‘head hair’ usually dissolved in water (not a useful quality for a moustache that is likely to be dunked in water, tea, coffee, juices, and beer throughout the day) and were not firm enough for stiff moustache hair. Specific moustache waxes and beard oils we had tried were often potently scented and never lived up to their claims. We felt sure that there must be a simple solution – after all, men have been shaping moustaches for centuries. By combining original vintage recipes with top quality modern ingredients (and a whole lot of testing variations on ourselves) we created our first moustache wax and beard oil. When the products started to take off, the name and packaging was created, reflecting the product’s US heritage – The Beard and The Wonderful was born. We now supply thousands of traditionally made grooming products every week that are loved by our customers because they have been proven to work over hundreds of years, are filled with natural, organic ingredients and are nut allergy safe. Please browse our product range here. You can also keep up to date with ‘The Beard and the Wonderful’ on Twitter, Facebook, Pinterest and Instagram.